Do you ever see a tree and think “Where did you come from, where are your parents, how did you get here?”? I occasionally ponder these questions when I see a tree that seems to be the only one of its kind growing in the area. 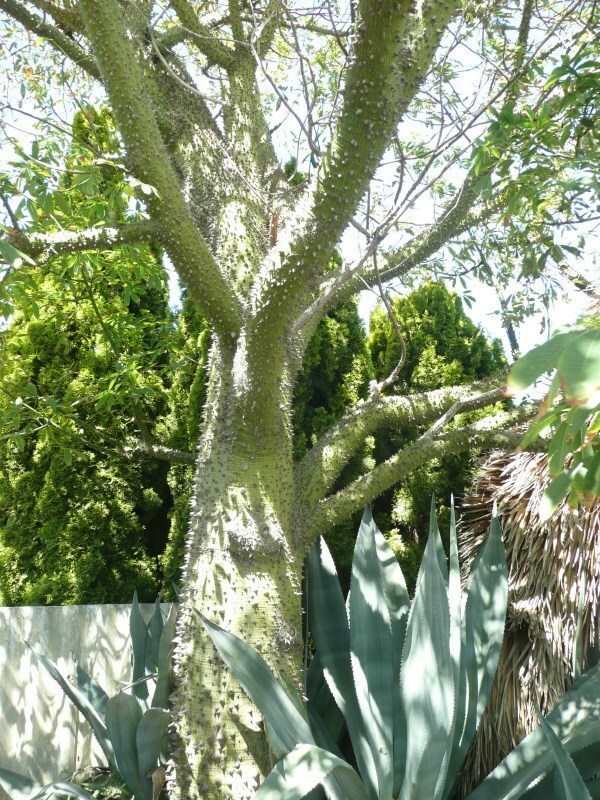 One such tree that I first saw about 20 years ago was growing on waste land in what is now an inner city suburb of Perth, Western Australia. At the time I was impressed by the gorgeous large white flowers with their showy red stamens and the attractive bi-lobed leaves. The tree itself was a bit straggly but as it had obviously been neglected for many years that was understandable. I was curious to find out what species it was as I had never seen one before. Using some library books that didn’t have photos I came to the conclusion that it could be a Bauhinia carronii or a Bauhinia hookeri. 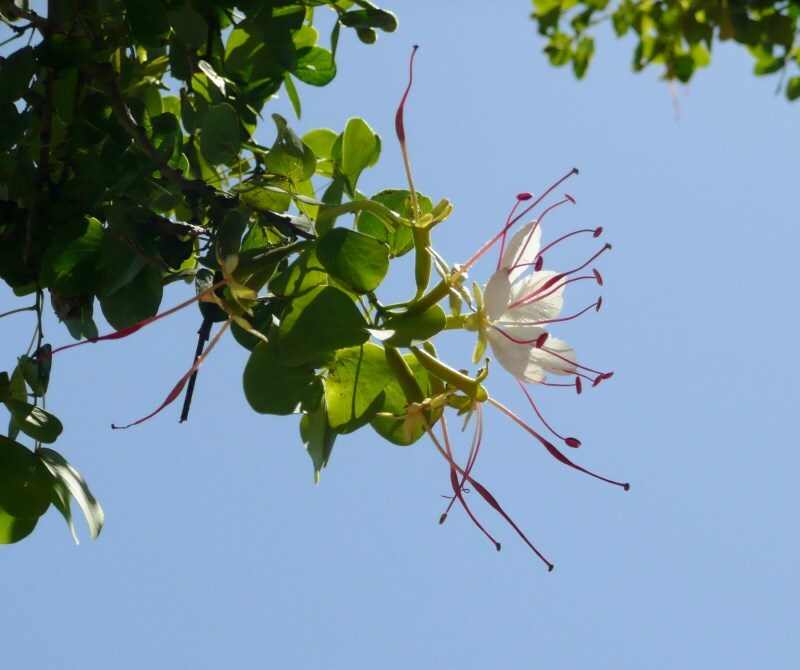 Eventually I saw some images on line and now believe that it must be a Lysiphyllum hookeri, also known as Bauhinia hookeri. In the intervening years I have returned many times in December to see it in flower. This year I didn’t get to see it until mid-January so it is little past its prime in the photos. The original tree and an offspring are thriving despite now being surrounded by new high rise apartments. 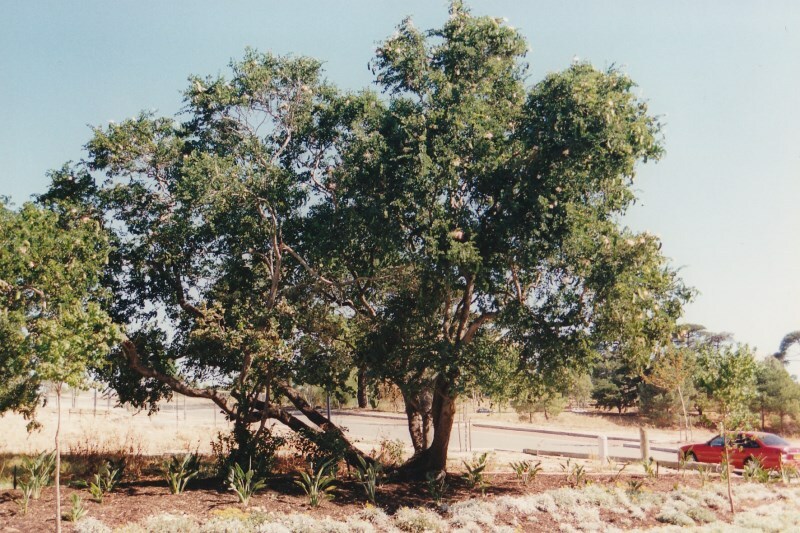 It is a native of Queensland and northern Australia where it is commonly known as Pegunny or Queensland Ebony. I grew a few plants from seed and distributed them to friends and members of the Gardeners’ Circle so there could be some plants which are getting quite large by now. I kept one in a pot for many years then, but in desperation because I had no space in my garden I planted it in a tiny triangle of soil in South Fremantle. It grew quite well, although the compacted alkaline soil and restricted space weren’t ideal. Lovely coppery coloured new foliage appeared in spring after a brief leafless period. I was very sad when it was blown over one winter before it had produced any flowers. In hindsight I wonder if I should have planted it in my garden instead of the Poinciana tree – it probably would have rewarded me with some flowers. 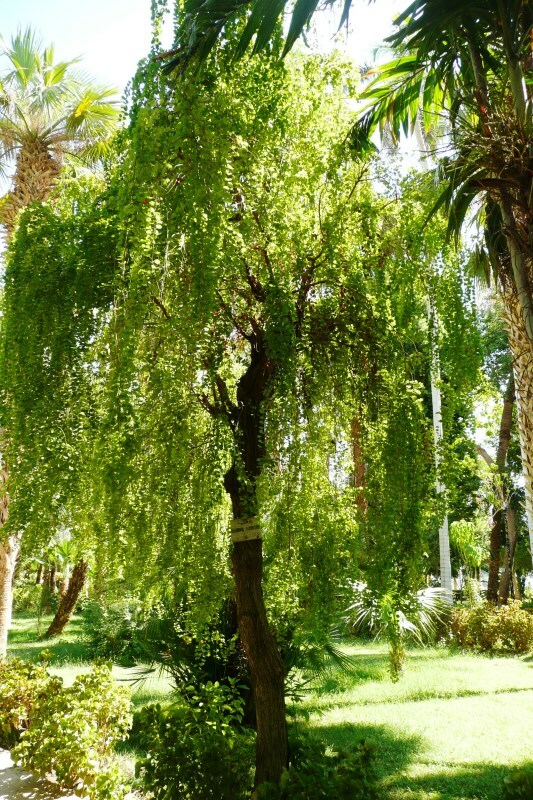 I’ve never come across another specimen growing in Perth but you can imagine my surprise when I saw another example of it as an extremely lonely tree, growing of all places, in Egypt. 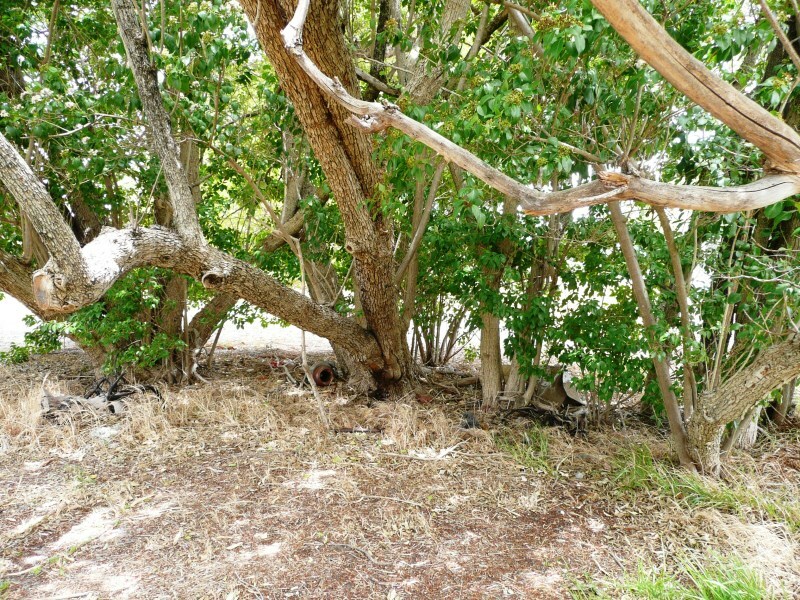 Yes there it was, in 2009, growing in the Aswan Botanic Garden on Kitchener’s Island. With lush soft cascading foliage instead of a tough arching canopy it was hardly recognisable except for the tell tail bi-lobed leaves. 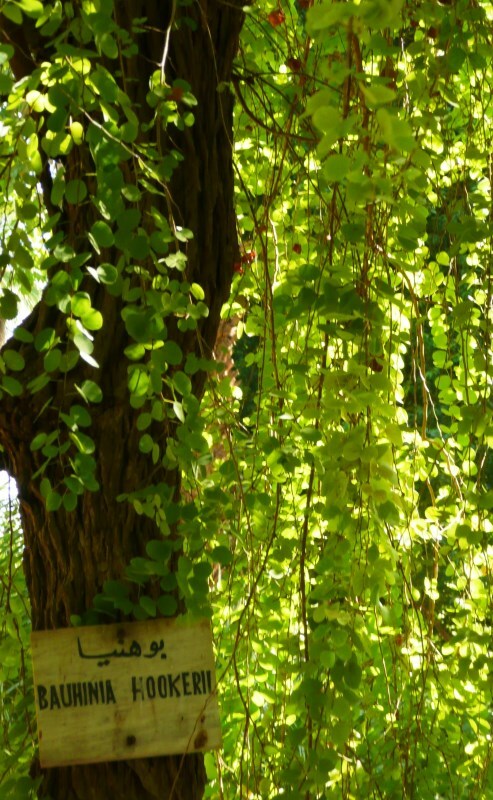 Without the label it could have any one of hundreds of species of Bauhinia and Lysiphyllum. I guess I’ll never know how it got to Aswan, or to Perth for that matter. It is a pity that these trees aren’t available at local nurseries because apart from being very attractive they are also very hardy and adaptable and I think they make lovely garden trees. Another lonely tree that I discovered is also growing on vacant land. 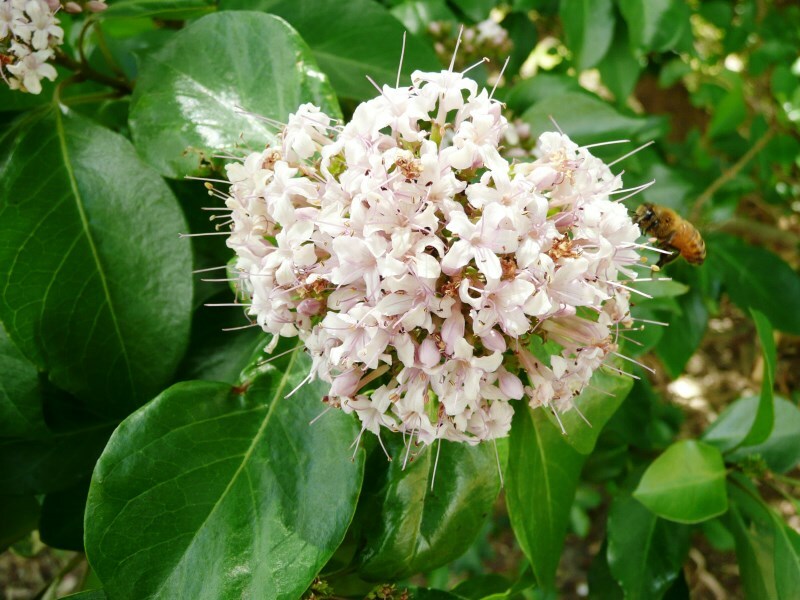 It flowers in summer from about November to January and as with the Lysiphyllum the photos were taken in mid-January and don’t really show the clusters of pale pink flowers with prominent stamens at their best. As far as I know the tree is evergreen. This tree turned out not to be as lonely as I had thought because instead of it being one large tree it is a clump of trees with a jacaranda growing up through them. 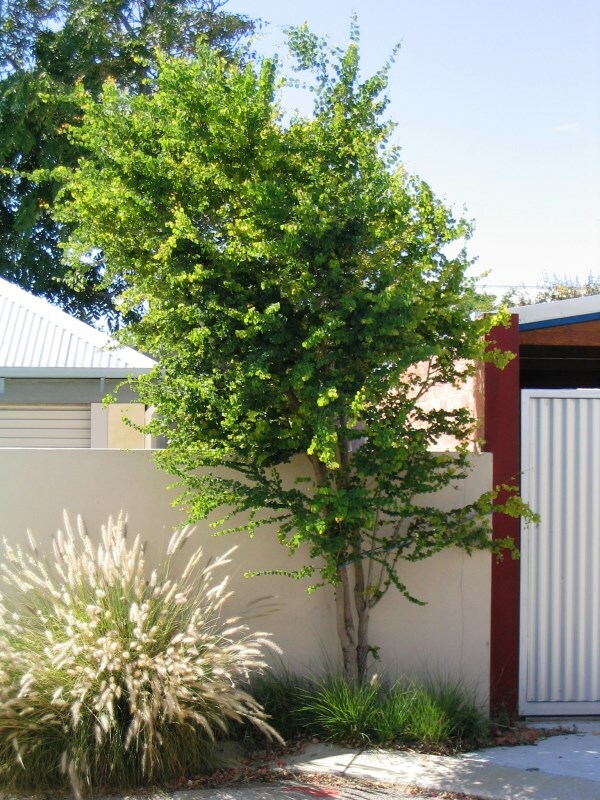 Also over the years I have seen as few large shrubs as I have been driving around which look as though they are the same plant but certainly they aren’t as tall as these specimens. Despite the fact that I first saw this clump of trees about 20 years ago I still haven’t identified what they are so if anyone can recognise them I would love to know. They have always seemed familiar and something that I should know but so far their identity has eluded me. I have seen one growing in the Sydney Botanic Garden and also in California but certainly no others around Perth, although they could be lurking in back gardens out of sight. 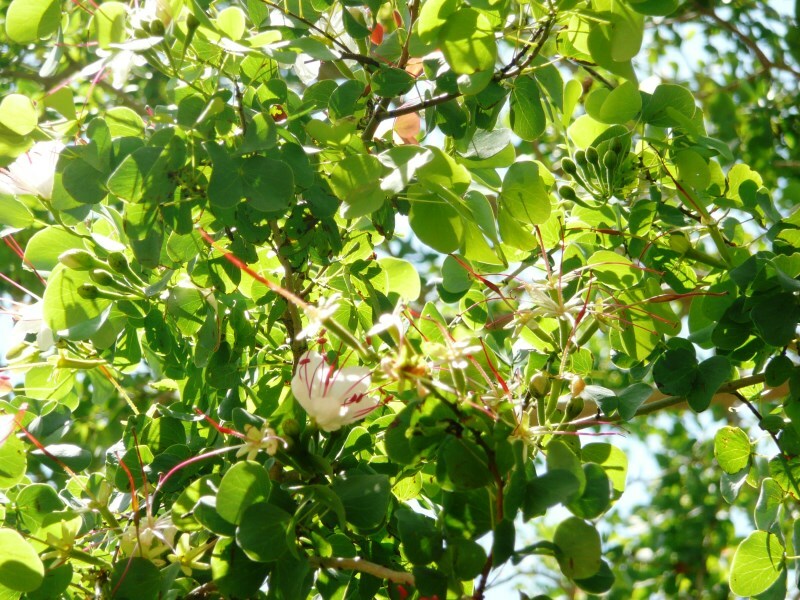 They are deciduous and are very attractive trees when in flower. The large unusual flowers are very variable but generally the petals are in various shades of pink. The ones in the photograph were picked in May and look striking in a vase. Some lonely trees are probably growing at the limit of their adaptability, others may be difficult to propagate and yet others may be unappealing to most gardeners and are therefore not grown much but each has managed to survive against the odds. I’ll never know how these trees came to be so far from their natural habitat and all alone in a foreign place but I am glad that I have been able to appreciate their beauty. 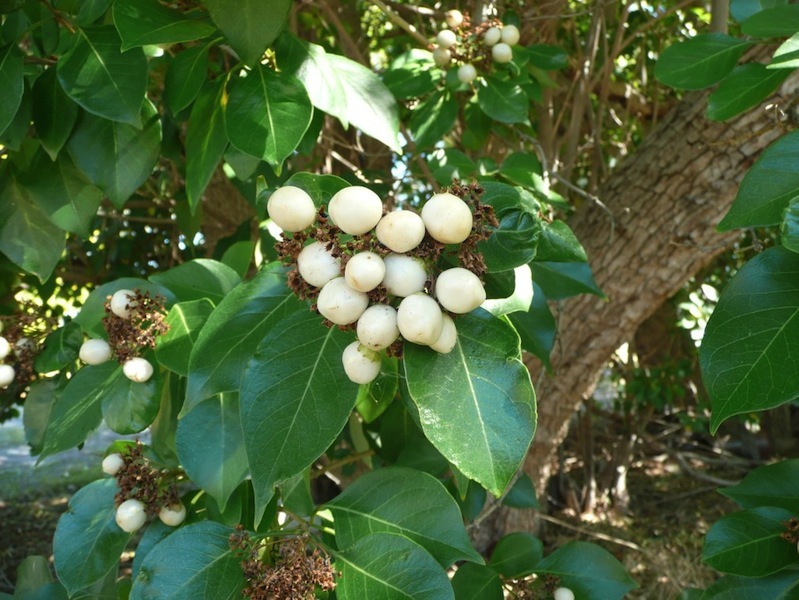 The unknown tree mentioned above is now decorated with bunches of shiny white berries. The round berries are about 1cm in diameter and those that I cut through contained two seeds similar to grape seeds. 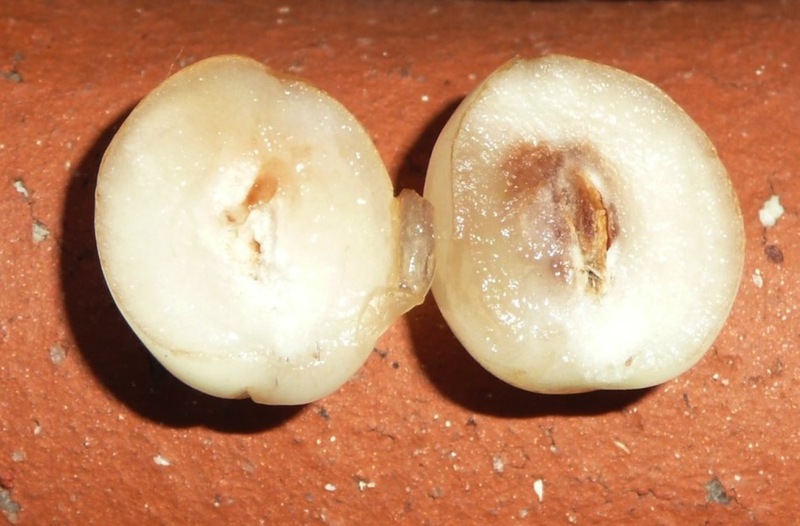 One seed of each pair was much larger than the other. The fruit on the north side of the tree are sunburnt probably due to the fact that we have had unseasonably hot weather this autumn. I thought the berries were pretty distinctive so I had another look through my books and on line but am no closer to identifying the tree. I’m still hopeful that one of the GardenDrum viewers will recognise it – fingers crossed. What a thought provoking question. It has made me consider many issues regarding our current gardening style. One thought that occurred to me is that we may be creating another sort of lonely tree. 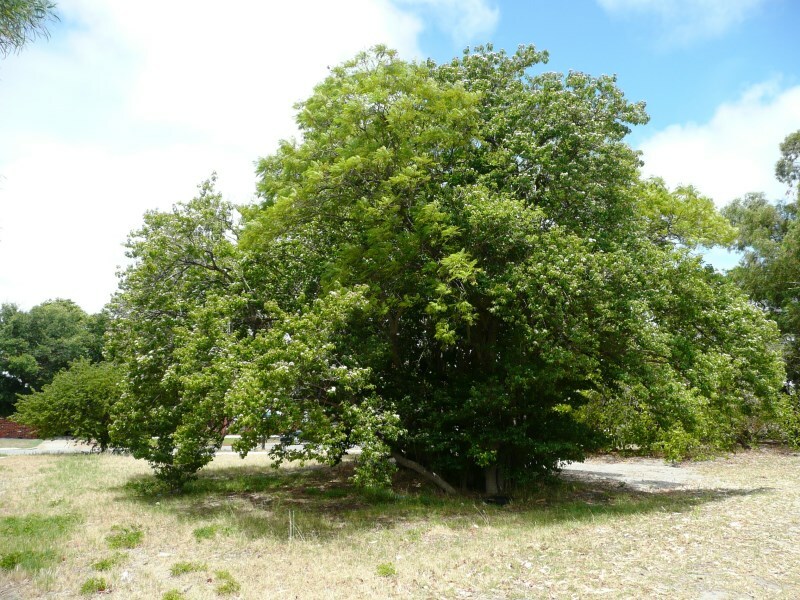 What about those trees that were at one time common in backyards but because of the shrinking size of gardens the majority are either removed when subdivision occurs or aren’t planted any more because their eventual size is too big. Over time there may be just a few specimens that have avoided being removed. We have a lot of ‘lonely trees’ here in Queensland. Often they can be traced back to one nurseryman or keen gardener who was obsessed with growing unusual plants from seed – and then sharing them with keen gardeners. 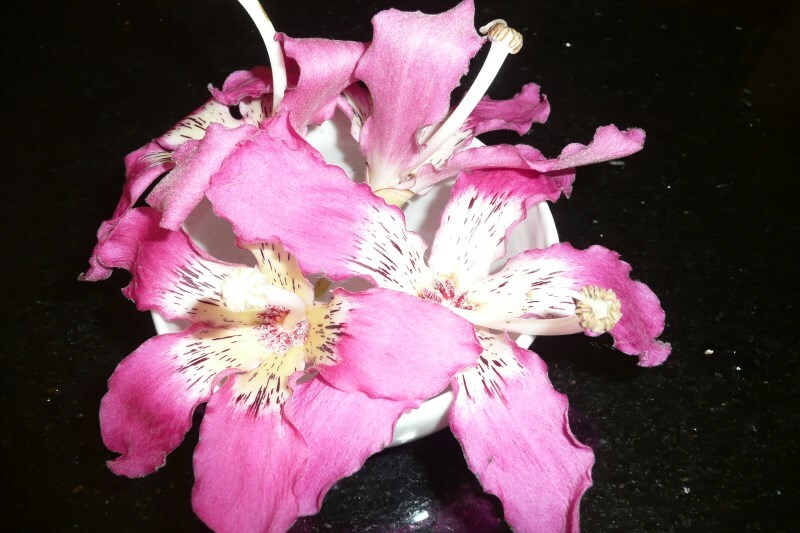 Lysiphyllum (now Bauhinia again!) hookeri is one of my favourite trees, particularly in early summer when the weight of new growth gives the branches a soft weeping character. 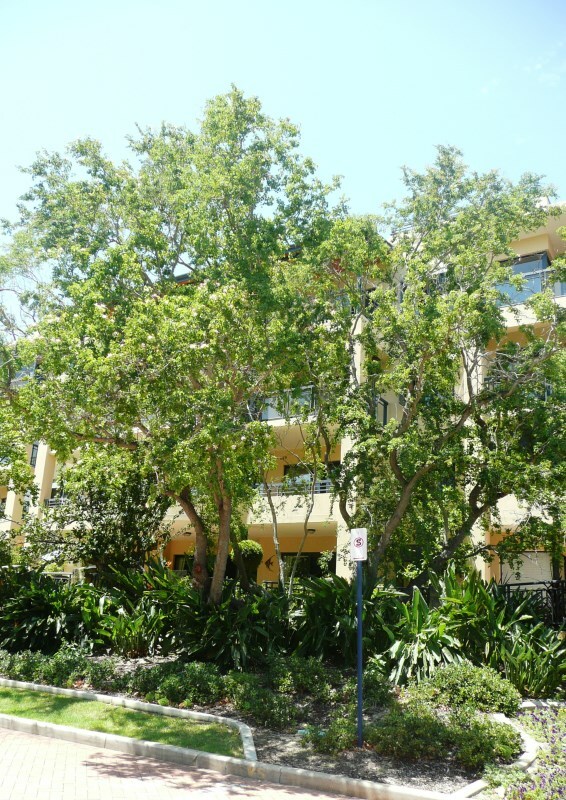 It is not too common in Brisbane, but you will find plantings in parks gardens and in some streetscapes. I think Harry Oakman is responsible for many of these plantings. He had a major influence on enhancing Brisbane’s image. 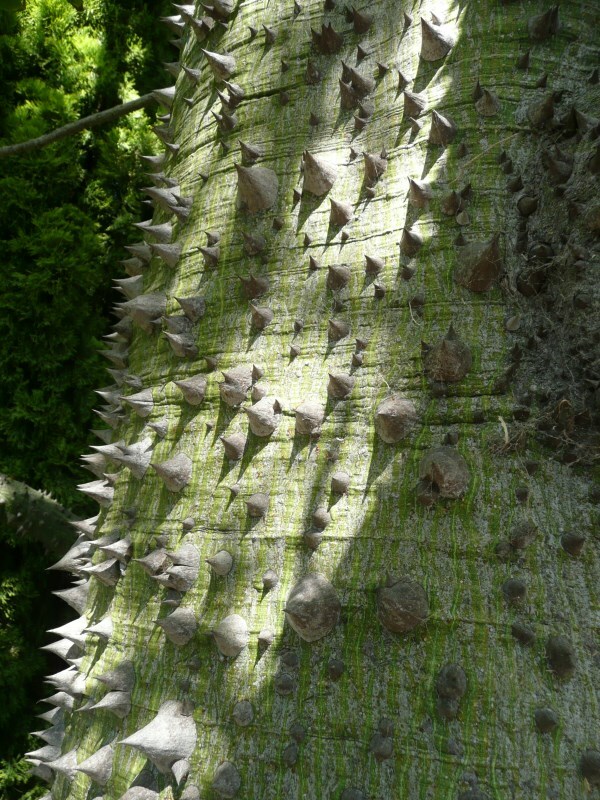 Chorisia (now Ceiba) spectabilis is another of my favourite trees. I love the trunk. These trees are very variable. Every one seems to have differently coloured and shaped flowers. In this region they set seed readily in winter and the white kapok surrounding the seed creates ‘snow’ which children love to play with. Your mystery tree has me stumped. I hope someone can identify it. Thanks for the update on the names – I admit I have trouble keeping up with the name changes. I agree it is a lovely tree – the one in East Perth flowers profusely during the Christmas period which is an added bonus. 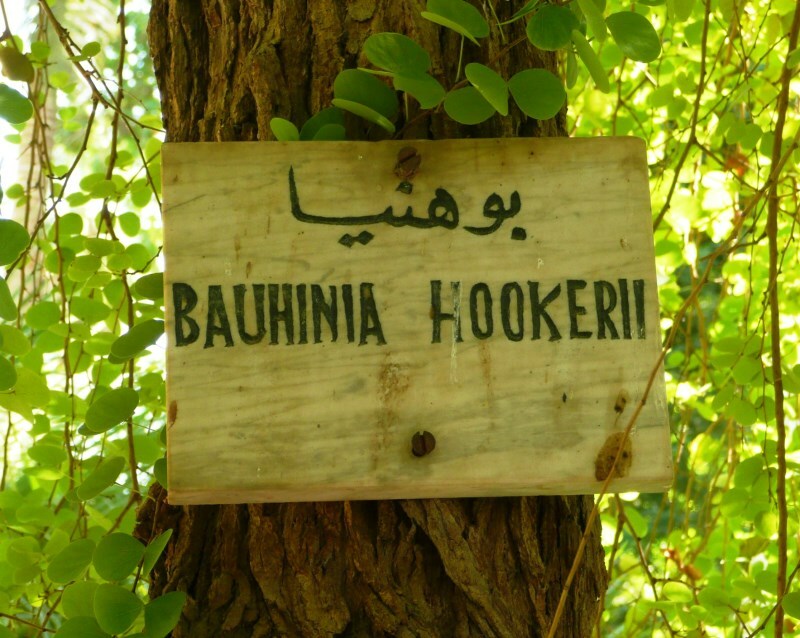 I’m surprised that it isn’t grown much more – perhaps reverting to the name Bauhinia will help! 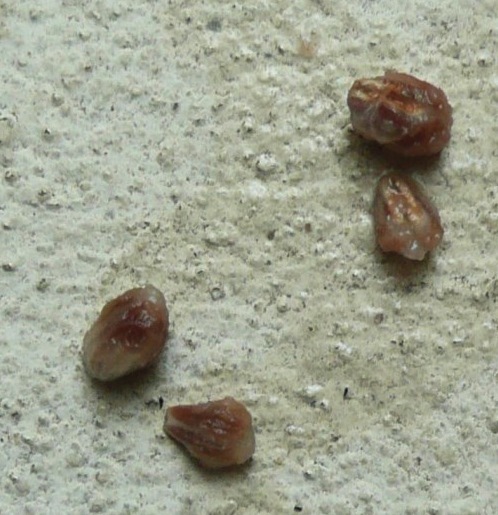 I have access to seeds if you would like to plant your own Lysiphylum Hookeri. I have planted 25 of my own and they are amazing. Next time I am in Queensland I will definitely seek out the Park. The flowers are reminiscent of a Viburnum cluster. The leaves are also similar to V japonicum. But the fruit are the wrong colour. 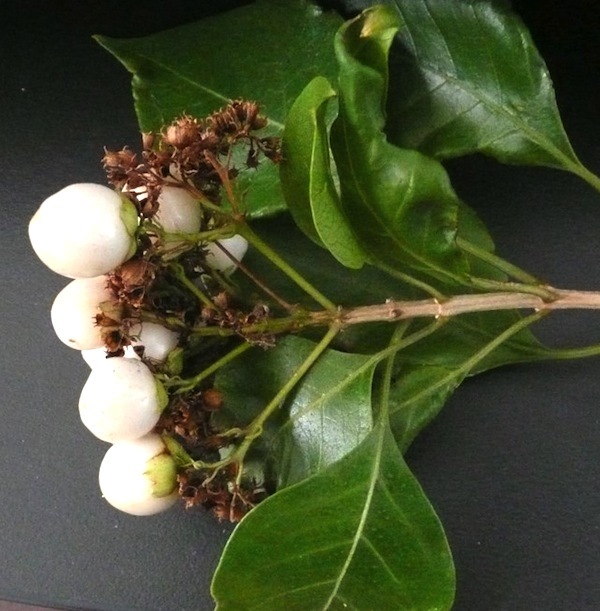 The fruit with the, are they sepals?, are similar to Clerodendron, but the leaves are different. Have you thought about contacting Peter Teese from Yamina Rare Plants? He may be able to identify for you. Good luck with the name. I for one am very interested. It is a beautiful looking plant, and is obviously remarkably hardy. Thanks for your suggestions. I haven’t actively tried to identify the plant for years but I will follow up with some experts as it is so much easier with the internet. Yes the fruit do seem to have sepals. Just a thought Linda, could your unidentified tree be Euscaphis japonica? Thanks for your suggestion Alison but I don’t think it is. Although there is a form with white berries the flowers don’t look right. I think you were closer with the viburnum suggestion – they have berries of almost every colour under the sun but I have yet to find a white one. 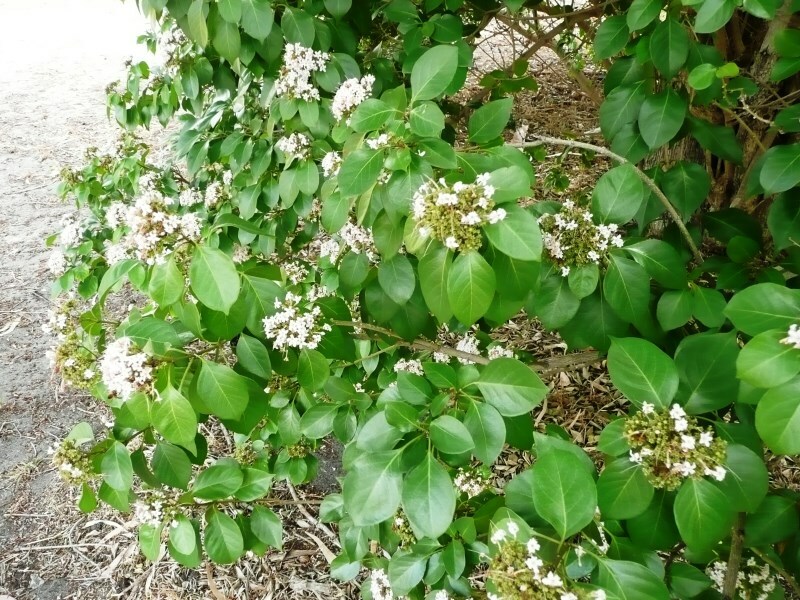 I have been following up various suggestions from people that I have emailed – Moonberries, Waxberries, Beautyberries, Elderberries and Pittosporums but no luck so far. I have also discovered that there are quite a few natives of Australia and New Zealand that have small 5 petalled flowers followed by berries. I am going to revisit the plant to see if the berries have changed colour. In the meantime…..